I was with DL and we were in a cinema/theatre venue. We were sitting/standing in a balcony area, so slightly looking down at the screen/stage. In front of us was a perspex or glass screen - like bullet-proof glass. There were some other audience members in this area, with the rest sitting in normal cinema seats. 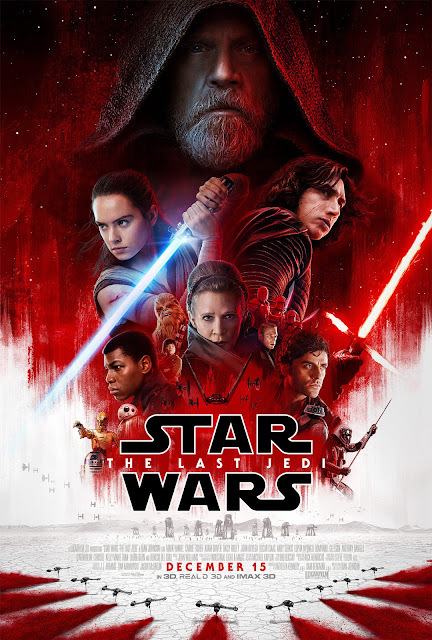 We were there to watch Star Wars: Episode VIII - The Last Jedi (2017) and it was the premiere, so everyone was very excited, including myself. The first scene seemed like we were watching it on a traditional cinema screen. This scene was very long and not much happened. 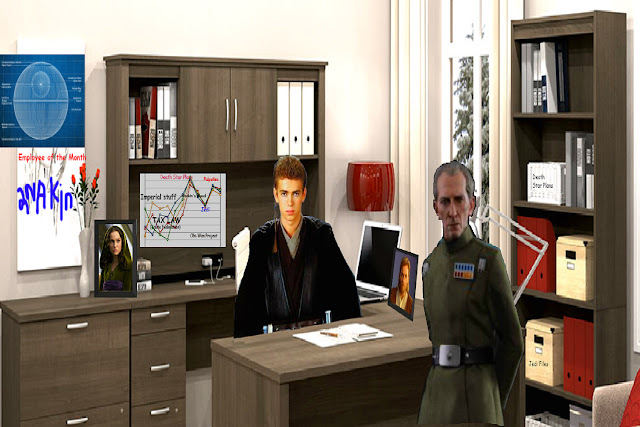 Anakin Skywalker was working in an office. He had been given an administrative desk job by the Empire, because he was 'taking time off from Jedi work due to stress'. The other characters in this scene were Grand Moff Tarkin, a couple of other lower-ranking members of the Imperial Military and some Stormtroopers. They all seemed to be engaged in some office work - looking at documents and spreadsheets.There was some kind of chart/graph on the wall next to a filing cabinet to the left of the office set. Anakin was the office junior and seemed depressed in his job because it was boring. He was sitting at a desk in the centre of the room, with some piles of paperwork in front of him. I cannot recall any specific dialogue from this scene of the movie other than Tarkin was very strict and officious and Anakin was really whiny and petulant. He was dressed in the brown outfit he wears in Star Wars: Episode II - Attack of the Clones (2002). I was telling DL that I wanted to see Snoke and find out who this character was. At this point, the cinema screen seemed to change into a theatre stage. There were no stage props - just an empty stage. I could see the red curtains either side. A man walked out onto the stage. He was middle-aged and white, wearing normal clothes which I cannot recall. There was nothing distinctive about him. He was holding a script and reading aloud from it - as if this was a rehearsal, not an actual play. 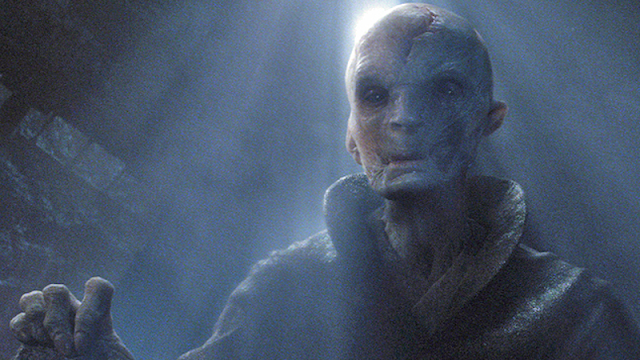 In the dream, this was still 'a movie' - and the second scene was now the introduction of Snoke. I was shocked that this male actor - looking like a normal human-being - was supposed to represent Snoke. I then saw that the words 'Snoke' and some other text showed up on the glass shield/panel in front of us, as if confirming what was happened in the movie. This looked like it was written in white marker pen. The Snoke character was boring. I said to DL that I thought The Last Jedi was really awful and not at all a proper Star Wars movie. It seemed more like a very badly acted rehearsal of an office-based drama. DL disagreed, saying that he thought this was the best out of all the movies. The rest of the audience seemed to agree with DL as they were cheering and clapping and generally loving the movie. I could not believe their exaggerated reactions and felt like I must be going mad as I was the only person who was having a negative reaction.